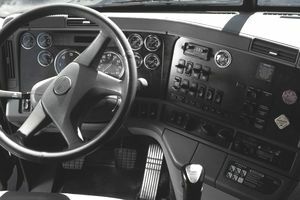 The dashboard on a semi-trailer truck, with all of the gauges and instruments, allows the driver to monitor more than just the engine’s performance. Much like pilots in airplanes, truck drivers pay close attention to their instruments to know the precise status of their vehicle. Commercial motor vehicles (CMV) are unique to the specifications of their manufacturers. However, you can expect to find a standard set of instruments and gauges on all semi trucks. The first red area shows if the battery is undercharged. The middle green area shows if the battery is normal. The right-hand red area shows an overcharge condition. Engine Temperature Gauge: This gauge may be marked Water Temp or Temp. This gauge displays the engine-cooling temperature. A normal reading will fall between 165 and 185 degrees Fahrenheit. Engine Oil Pressure Gauge: The engine oil pressure gauge will have a higher psi (pounds per square inch) when the oil is cold. As the engine warms up, the psi will fall. Normal readings run from 30 to 75 psi. Transmission Temperature Gauge: The transmission temperature gauge should have a reading from 180 to 250 degrees. Rear Axle and Forward Rear Axle Temperature Gauge: This gauge will have a normal range from 160 to 220 degrees. Tachometer: The tachometer displays the engine's revolutions per minute (RPM). Multiply the number on the tachometer (also known as tach) by 1,000 to calculate your RPMs. Speedometer: The speedometer displays your current speed, either in miles per hour (MPH) or kilometers per hour (KPH). Odometer: This gauge displays your total miles driven and on some models the total engine miles overall. Throttle: The throttle is used to set engine speed or RPMs. The throttle may be used in cold weather to keep the cab warm while the engine is idling. Each model of truck is different and if there is no throttle control, that means it has been replaced with electronic cruise control. Ignition Switch: The ignition switch turns on the power unit's electricity. Fuel Gauge: The fuel gauge displays the power unit's current fuel supply. Fuel Filter Gauge: This gauge shows the condition of the fuel filter. There are two color sections, white and red. The red zone indicates a clog in the fuel filter. Air Filter Indicator Gauge: The air filter indicator gauge monitors the temperature outside of your vehicle. Inter-axle Differential Control: A power unit will have this particular switch if it has dual rear axles with inter-axle differentials. When unlocked, each axle shaft and wheel can turn at different speeds as the vehicle turns. Cold Start Warm-Up Switch: This switch is specifically for cold weather when the engine may be hard to start. Turn this switch on to preheat the engine. Exhaust Brake Switch: This switch is turned on when you need extra slowing power. It is especially useful when on steep grades or when heavily loaded. A warning light will emit when something is wrong with oil level, water level, low air pressure, or low vacuum pressure. A light should come on when high beams are deployed. The light switch may either be on the dashboard, on a turn signal handle, or on the floor near your pedals. This light remains on as long as your differential is in the locked position. This light warns you if your battery is not charging. The CMV's owner's manual is a helpful tool for finding these switches and gauges and also for determining what their particular warnings mean. Every time you are in a new CMV, take the time to become familiar with the dashboard. Locate the owner's manual and read it thoroughly before operating the vehicle so that if you encounter a problem, you can quickly learn about and perhaps diagnose the issue.